Description: The guy in red just looks angry that he doesn't get to keep fighting. This is insane. 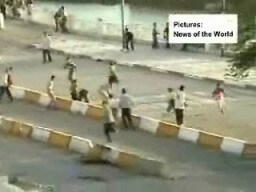 Some Iraqi children are caught after they throw rocks at a group of soldiers. The soldiers chase them down, drag them back to their compound and beat them pretty badly. I hope these aren't U.S. Troops doing this.